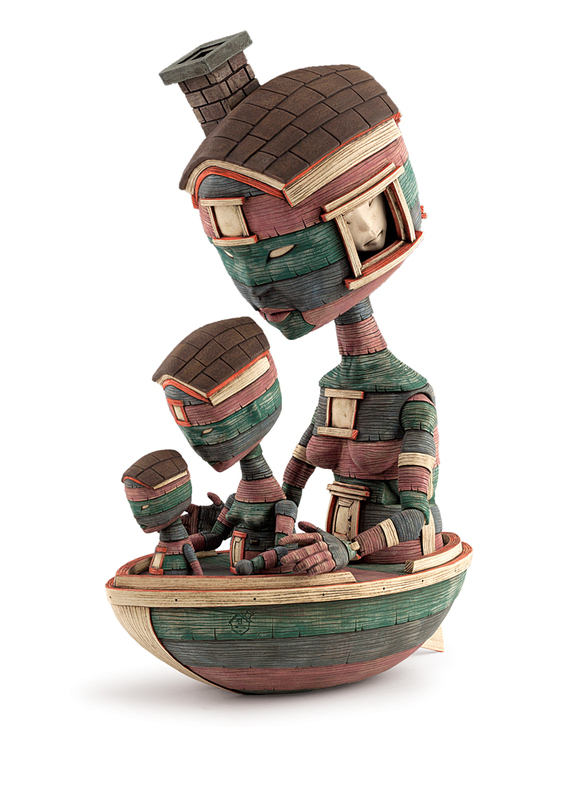 In an overwhelming universe, Calvin Ma’s charming clay figures carry a sense of calm. Published on Thursday, May 3, 2018. This article appears in the April/May 2018 issue of American Craft Magazine. Lighten Up, 2017, stoneware, glaze, 16 x 13.25 x 9.5 in. 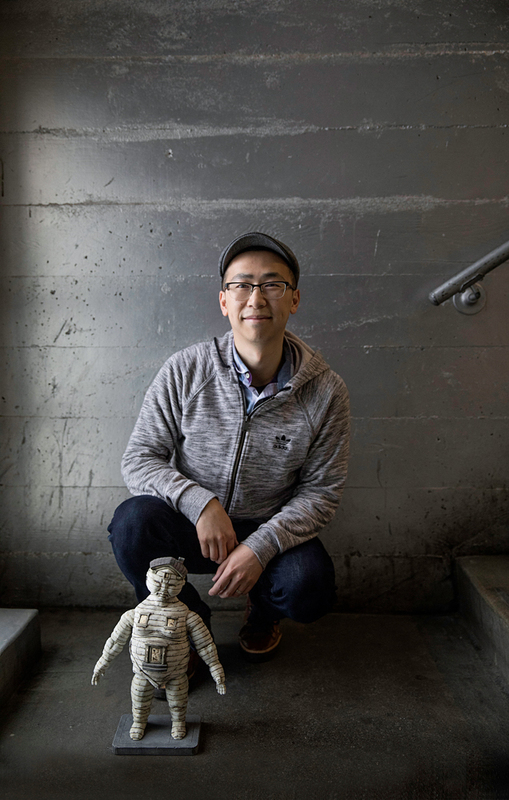 It’s no big deal that Teenage Mutant Ninja Turtles were Calvin Ma’s favorite action figure toys as a boy. After all, the green warriors for good were wildly popular when the 34-year-old artist was a kid. And it turns out that his go-to choice of toys was almost uncannily appropriate as a harbinger of the work he creates now. 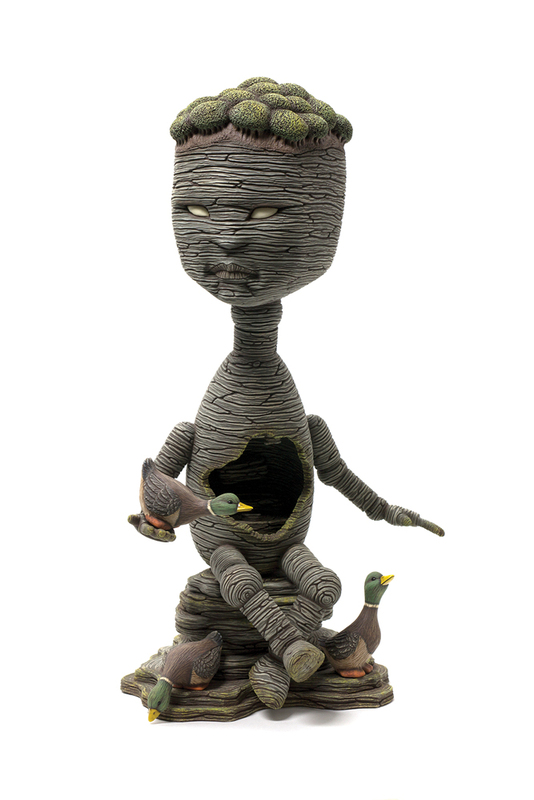 The ceramic figures in Ma’s Homebodies series not only carry their houses around wherever they go, as turtles do, they are the houses. Their large heads are topped with shingled roofs and brick chimneys, sometimes emitting spherical puffs of smoke. Their bodies, and the fantastical vehicles or whimsical steeds they ride, are ribbed and textured, like slats of wood. That’s one way for an artist with social anxiety to re-create the easy, familiar space of home, even as he moves through potentially uncomfortable situations out in the world. Ma has earned recognition most artists would covet – first place at the ACGA Clay and Glass National Juried Exhibition in 2013 and Best of Show at the Workhouse Arts Center Clay National competition in 2012. But, while gratifying, those and other awards have landed him in crowded artist receptions and other not-so-comfortable social events. He tolerates those gatherings because, for him, making his figures is not only art, it’s therapy. 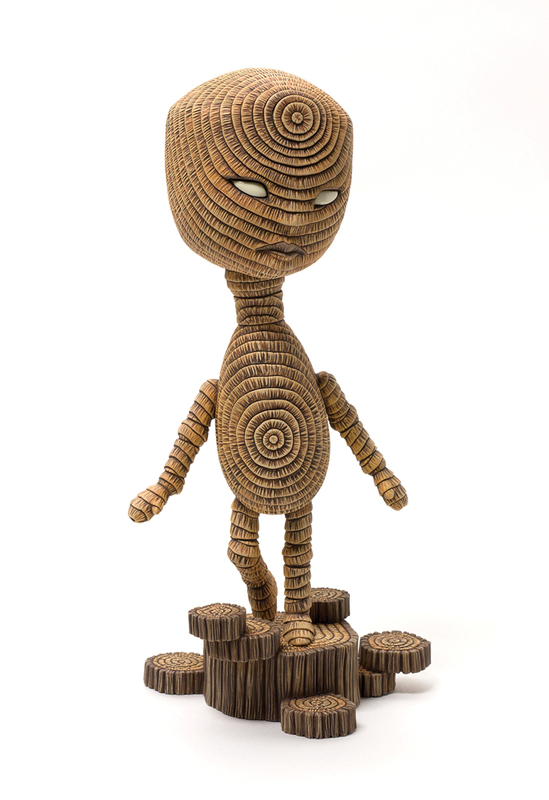 As he works, the San Francisco ceramist returns to the state of private, unfettered imagination that held him in thrall as a boy, when stories of action and heroism unfolded through characters he could manipulate. Except that now, in his Homebodies and Blend In series, Ma’s love of play and fear of crowds are the inspiration for his vulnerable figures doing the best they can in the world – like all of us. Growing up in San Francisco, Ma always had small animal companions – hamsters, turtles, goldfish – and a couple of good friends. But, for the most part, he found it difficult to socialize with other kids. “I wanted to be part of a group, but something inside me prevented it,” he says. So he spent long stretches of time lost in the world of action figures. The Ninja Turtles were appealing in part because, while the four characters have very different personalities, he says, “I loved how they all got along. The smart one, the tough one, the renegade, and the fun one – a happy, weird turtle family.” Often, he would use the figures to replay a cartoon episode he’d just watched and then continue the story beyond the ending of the show. 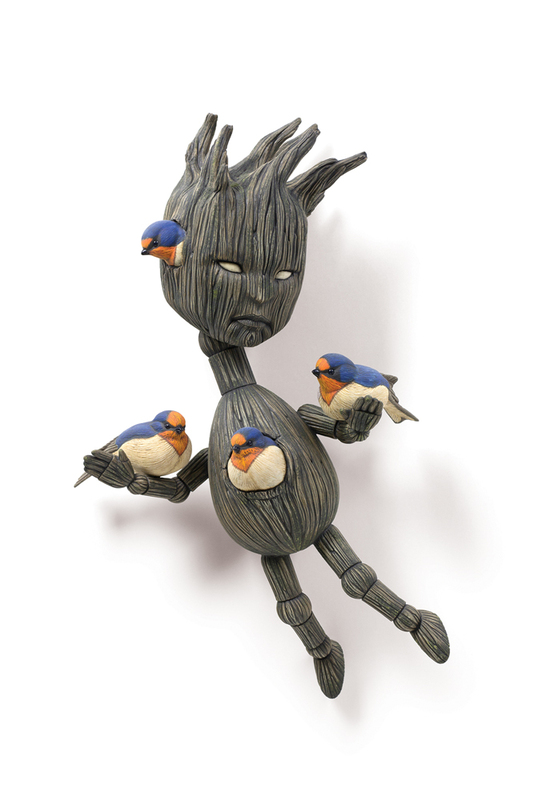 Growing up, Calvin Ma loved action figures; his boyhood passion blossomed into an art career. 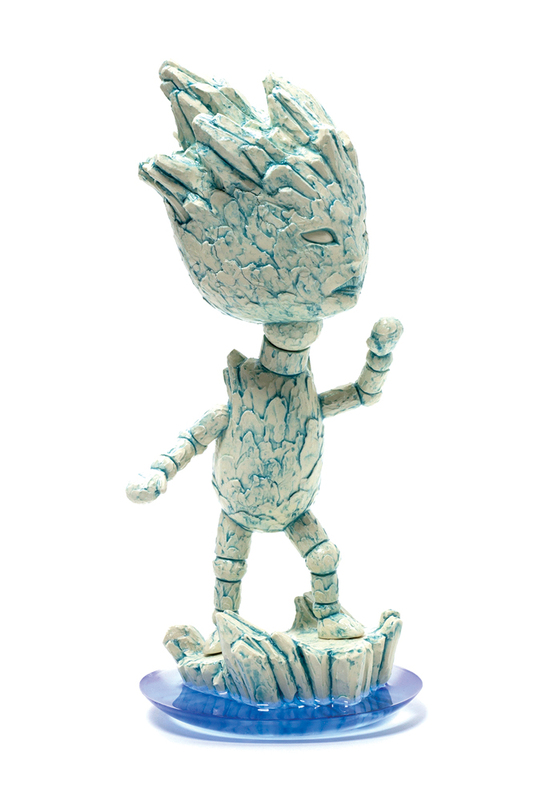 Today the San Francisco ceramist makes expressive figures such as Reserved (2010) that draw on his struggles with social anxiety. Brace Yourself, 2017, stoneware, glaze, resin, 10.5 x 5 x 4.5 in. Sway, 2017, stoneware, glaze, 15 x 9 x 4.5 in. Take Flight, 2017, stoneware, glaze, acrylic rod, 15.5 x 9 x 11 in. Weather It, 2017, stoneware, glaze, 12 x 6 x 4.5 in. Feeling Small, 2013, stoneware, glaze, stain, 13 x 5 x 9 in. One Step at a Time, 2017, stoneware, glaze, 9.5 x 4.5 x 4 in. Stag, 2015, stoneware, glaze, stain, 16 x 7 x 7 in. Different Beat, 2017, stoneware, glaze, luster, 20 x 12 x 9 in. 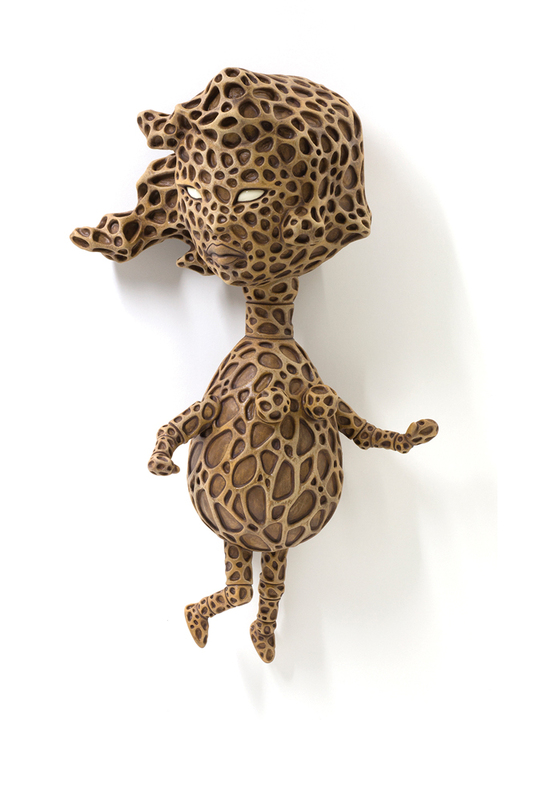 The Walk, 2013, stoneware, glaze, stain, 16 x 14 x 6 in. At Arm’s Length, 2017, stoneware, glaze, 9 x 7 x 4.5 in. Cave In, 2017, stoneware, glaze, resin, 13.5 x 7 x 7 in. Little Me, 2017, stoneware, glaze, 15 x 8.5 x 5.5 in. 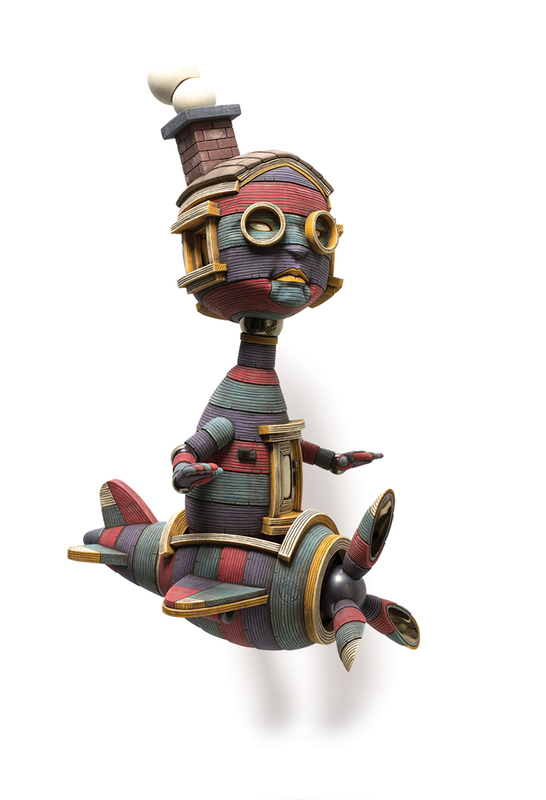 By the end of high school, Ma had developed an interest in drawing, but his parents hoped to nudge him toward a “paying job.” So he struck a compromise: He earned a BA in industrial arts from San Francisco State University, with the aim of working in the toy industry in product design. 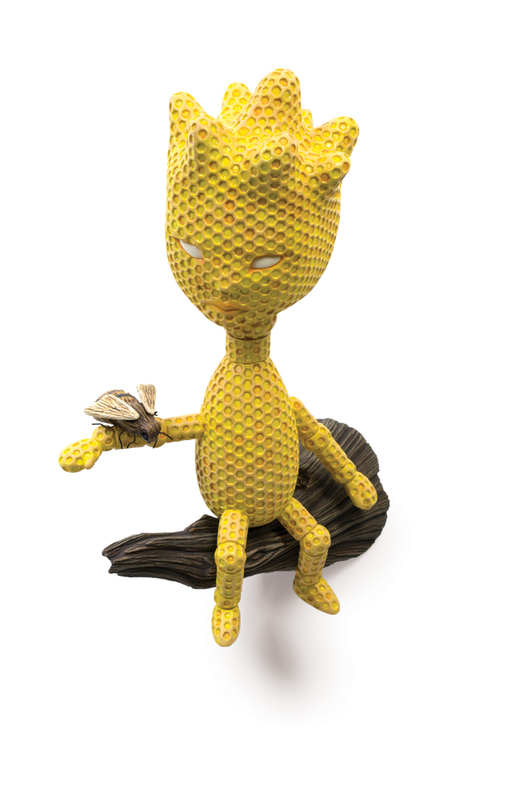 Initially drawn to polymer clay, he studied sculpting, model- and mold-making, and casting. After taking a few months off after graduation, he enrolled in the Academy of Art University. “With the first ceramics class, I fell in love with the material. It reminded me of being a kid with the action figures,” he says. Homebodies began as part of that series, with a figure trying to blend in as a house. Ma loved the way it looked and immediately recognized the wealth of stories such a character could tell. Here was an “action figure” who feels most comfortable and genuine at home. So whenever the figure goes out, the protective barrier of walls and a roof come along. Often a creature or an odd mode of transport is part of the piece, just as animals and vehicles made Ma’s action-figure play more interesting as a boy. Now, however, the vehicles or accessories that accompany the Homebody help tell a story about an emotion or experience. Ma remembers being in grad school and disembarking from the city bus at the university, along with scores of other students. Caught in a surge of torsos and legs as the crowd streamed onto campus, he found himself suddenly feeling nervous, awkward, and small. He became so self-conscious that he had to slow down, refocus, and remind himself how to walk. 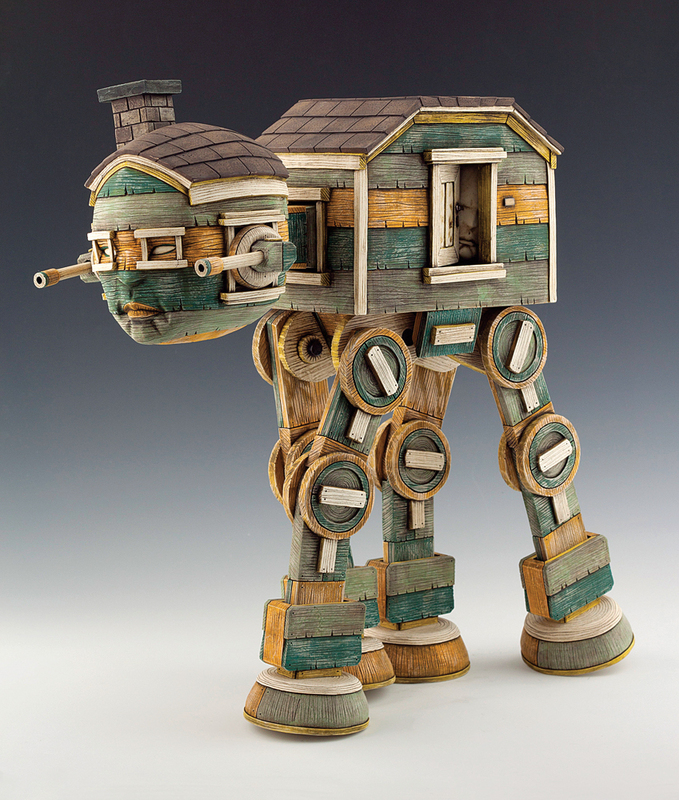 He connected that feeling with the AT-AT from Star Wars, a giant transport and combat vehicle with four lanky, giraffe-like legs: In The Walk (2013), Ma reproduced his discomfort through a long-legged Homebody concentrating hard just to get around. Ma also riffed on the movie Spaceballs, a spoof on Star Wars, in which the film’s goofy characters travel through space in an RV with airplane wings. Aware that he tends to take himself too seriously, he created Lighten Up (2017), in which a winged RV is a reminder to do just that. 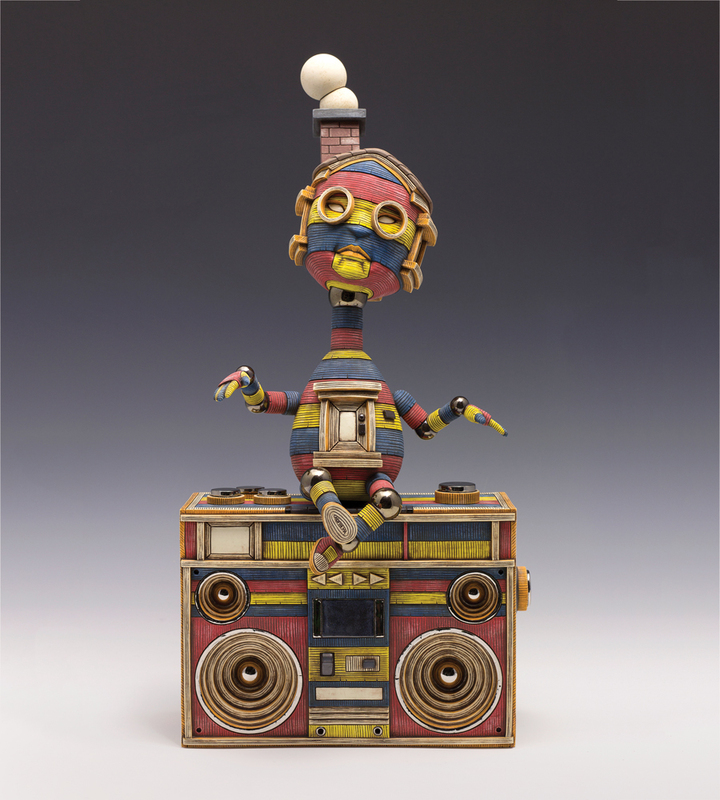 He plans other new works with Homebodies interacting with those of their own kind or with objects – a boom box, a typewriter, a camera – that stand in for feelings and memories he associates with artifacts from his past. 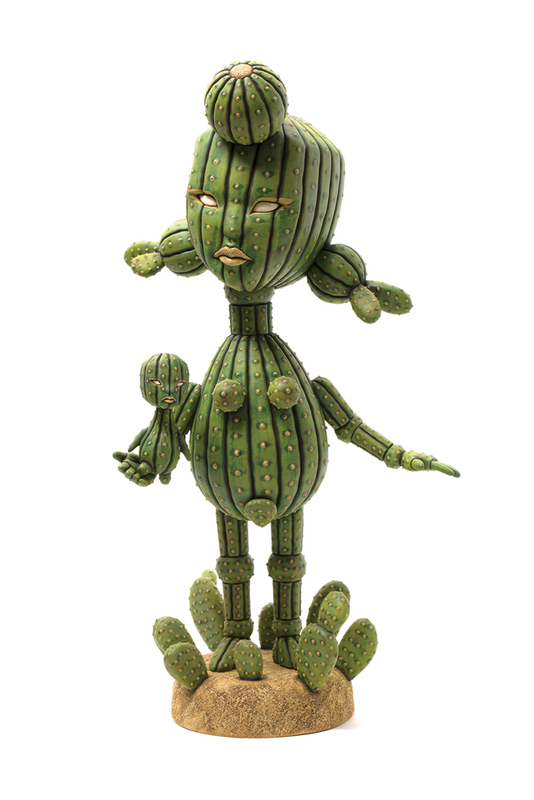 Calvin Ma will have a solo show at Tansey Contemporary in Santa Fe, June 22 – July 15.